Grab the T-shirt (or tank or whatever you want to make flowy!) and cut off the hem at the bottom! I chose to cut the hem off the neck as well to create a more laid back look and to open up the neck a little more. If you want to cut the neck it's up to you! Then cut open both sides of the shirt along the seams (if there is no seems just simply eye ball it) from the bottom of the shirt to the arm pit. DO NOT CUT THE SLEEVE! Take the second shirt (if you want to hide the alterations you made, make sure the second shirt is the same color as the first, although it could be pretty cool if you did a second color!). On the shirt mark out a long triangle. 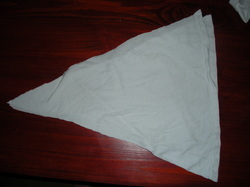 The triangle should be an inch or two longer then the sides you cut open on the first shirt. Place each triangle inside the openings on either side and stitch them up. The triangles will help the shirt flare out at the side. The fun thing about this technique is that you can add as many or as little and a large or as small triangles as you want. 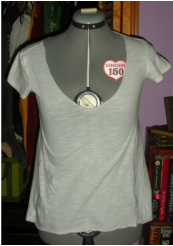 You can make a super slouchy shirt or just make a shirt less tight! Completely up to you!